The World and a Very Small Place in Africa is a fascinating look at how contacts with the wider world have affected how people have lived in Niumi, a small and little-known region at the mouth of West Africa’s Gambia River, for over a thousand years. 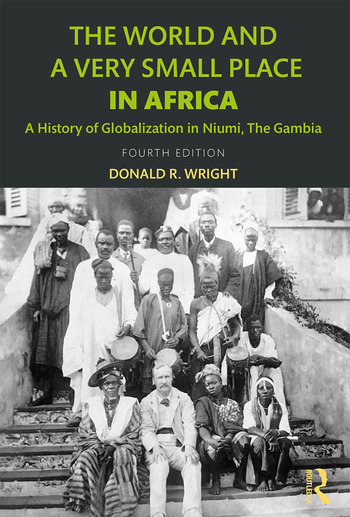 Drawing on archives, oral traditions and published works, Donald R. Wright connects world history with real people on a local level through an exploration of how global events have affected life in Niumi. Thoroughly revised and updated throughout, this new edition rests on recent thinking in globalization theory, reflects the latest historiography and has been extended to the present day through discussion of the final years of Gambian President Yahya Jammeh’s regime, the role of global forces in the events of the 2016 presidential elections and the changes that resulted from these elections. The book is supported throughout by photographs, maps and Perspectives boxes that present detailed information on such topics as Alex Haley’s Roots (part set in Niumi), why Gambians take the risky "back way" to reach Europe, or "Wiri-Wiri," the Senegalese soap that has Gambians’ attention. Written in a clear and personal style and taking a critical yet sensitive approach, it remains an essential resource for students and scholars of African history, particularly those interested in the impact of globalization on the lives of real people. Donald R. Wright is Distinguished Teaching Professor of History, Emeritus, at the State University of New York—Cortland. His other books include two on early African American history, and a two-volume collection of oral traditions from The Gambia, and (as co-author) The Atlantic World: A History (2007).